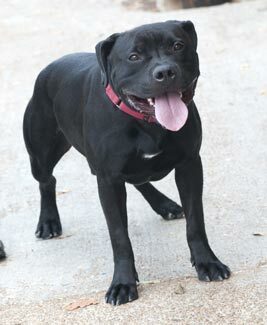 Igneous is a 2 year old male terrier mixed breed dog. In person he's as solid and handsome as the photo to the left. He has an amazing head that he loves to have rubbed. And who could ignore that ear-to-ear grin. Igneous wants to be a lap dog, even though it would take a big lap to hold his 64 pounds. He loves people and craves human attention. He would do best as the only dog in the home. A playful guy, he like to release some of that energy through exercise. If you need a physical fitness buddy, someone who is guaranteed to get you off the couch and into the outdoors, Igneous is your dog. Igneous is currently living at Stray Rescue of St Louis's Pine Street animal shelter: 2320 Pine Street, St Louis, Missouri. Call them for more information about Igneous at 314-771-6121. Founded by Randy Grim, Stray Rescue's sold purpose is to rescue stray animals in need of medical attention, to restore them to health, and then place them in loving adoptive homes. View the video below to learn more about Randy Grim and Stray Rescue. As Randy notes, East St Louis is probably second only to Detroit in being very mean streets for homeless dogs. 50% of the animals rescued have been victims of gunshots. Thanks for sharing. I don't understand why black and larger black dogs don't get adopted as quickly as other colors etc. Wishing a happy forever home for Igneous. Thanks also for sharing about Randy Grim. Rescue Rocks! Bless those rescued and the rescuers! Oh my goodness. First he is big and beautiful. Second what that rescue does is incredible. Great post!